We visited Hong Kong for 4 days on the way to Scotland in December 2014 and this was our first experience of Asia. As we were looking to move to Hong Kong in 2016 we thought a short stopover would be a great way to have a taste of our potential new home. Getting from the international airport to Kowloon or Hong Kong Island is very easy. The MTR airport express train is a frequent service that takes about 15 to 20 minutes and leaves right from the airport terminal. There is a MTR service desk in the arrivals hall of the airport where you can purchase an Octopus card. Having an Octopus card is essential for any visit to Hong Kong and once you have your card you can just loads it with cash at easy to use self-service terminals which are found at all MTR stations. The card can also be used on most forms of transport within Hong Kong including MTR, Start Ferry and trams (including the Victoria Peak tram). Transport in Hong Kong is relatively cheap and a really efficient way to move about the city and get you to places you want to go. As Hong Kong is one of the most density populated place on earth accommodation is not cheap and we struggled to find reasonably priced backpackers. We eventually opted to stay in Kowloon in a small hotel/hostel called the Hop Inn just off Nathan Road (http://www.hopinn.hk/index_en.php). The rooms were small but it was affordable by Hong Kong standards. Our accommodation was in easy walking distance to an MTR station so it provided us with a god base. We would recommend if you are looking for accommodation, opt to stay near a station. There is a lot to see and do in Hong Kong and walking around the central area on Hong Kong Island and along Nathan Road in Kowloon gives you a chance to get a real feel for the place. We also found the Mid-levels and Soho to be a great place to spend time with plenty of places to eat and drink. Victoria Peak is on Hong Kong Island and one of the must visit places. To get to the top you can either endure a painfully steep walk or take the Peak Tram. The Peak Tram can be really touristy so it is advised to go early and pay with your Octopus Card to avoid queues. Once at the top there a loop track which takes about an hour to walk round. The track provides great views around the Island and across the harbour to Kowloon. There is also a shopping mall and some food places but we stayed away from these. We did a day trip to Lantau Island where we saw the Big Buddha and Tai O fishing village. Best way to get to Lantau is to take the MTR to the end of the Tung Chung line. Then from there take the Ngong Ping 360 cable car as this takes you straight to the Big Budda. The cable car can get busy but (what we didn’t realise) is that you can book online which allows you to jump the queues, sadly for us we waited over an hour. The ride on the cable car was well worth the wait as the ride gives you views across the North West part of Lantau Island and Hong Kong Airport. Once at the top it’s a short walk to the Big Buddha from the cable car. The Buddha is the main attraction here however it’s also worth visiting the Po Lin Monastery whist you’re up there. The other main attraction on Lantau Island is the fishing village of Tai O which is a short bus ride from the Big Buddha. This fishing village is a total contrast to downtown Hong Kong with a much slower place of life. It’s a great place to spend an afternoon just wandering the small streets and along the harbour. It is also a good place to get a meal as it is cheaper than the more touristy places at the Big Buddha. It is really easy to take a day trip to Macau as it is only an hour’s ferry ride from Downtown Hong Kong. Be careful to buy your ticket from a trusted sales office at the terminal. Don’t listen to all the people that approach you to buy a ticket from them. Macau is a former Portuguese colony and is now a SAR of China. It’s a very different place to Hong Kong and we found a day was all that was needed to see the place (unless you like casinos). Make sure to taste some of the food that is on offer, we enjoyed eating at a Portuguese restaurant and eating the egg tarts. Hong Kong is a great place for shopping. The city has a huge number of shops, malls and markets with everything you could possible want available. We don’t normally like shopping but our inner shopaholic got us at a shop called Muji and we did go a wee bit crazy, on the plus side we had some nice new clothes to take to Scotland. 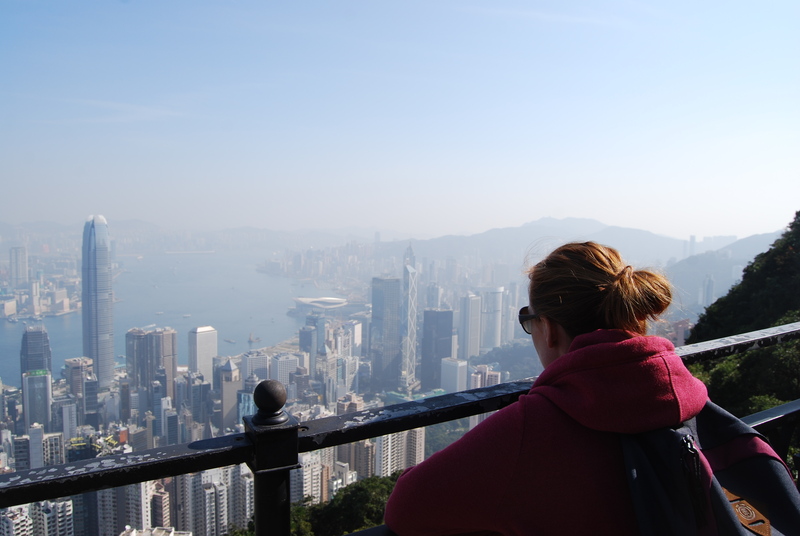 We didn’t really have a budget for Hong Kong as it was just a stopover. We stayed at a small hostel/hotel it a lot cheaper than a mainstream hotel. We also tried to eat locally where possible, although some of these experiences were a bit hit and miss but generally a fun experience. We also did a bit of shopping and found that generally the prices for goods are comparable to New Zealand. Food and other minor spending money – HKD$2,100 (each), this mostly covered our transport, activities and food for the 4 days. Overall, Hong Kong is an amazing lively city and we are really looking forward to going back and making a life there for a while.